I SPENT a bit of time watching the final day of Yorkshire’s County Championship match against Middlesex from high up in the Rugby Stand in an effort to soak up the atmosphere and to get a better view of proceedings from behind the bowler’s arm. Cricket press boxes do not always provide the best vantage point, while their mainly enclosed nature means that you do not always get the same feel for the sights and sounds of the day that you do when sitting out in the open. Why, behind the thick glass windows of a modern cricket press box, you often cannot hear very much at all beyond the sound of wine glasses being filled and refilled and of cigars being lazily unwrapped after we have all consumed our caviar and chocolate cake. You simply do not get that same appreciation of the surrounds that you do from slumming it in the crowd. It was instructive, therefore, as I sat in that Rugby Stand while slurping goulash out of a thermos flask, to soak things up from a different perspective as Yorkshire embarked on their ultimately successful pursuit of 213 for victory. Well, it must have been at about 2.30pm when a strange sensation began to sweep over me as the noise of a car alarm that had gone off somewhere on the nearby Kirkstall Lane suddenly struck me as soothing rather than irritating. In fact, I almost came to enjoy the repetitive beeps as the noise continued for a good 20 minutes. Had I gone mad, I wondered? Was there something in the goulash, perhaps? A bad batch from Budapest? Or maybe a delayed reaction to the vat of wine I had consumed in the press box during the morning session? It was then that the answer hit me in a flash of wondrous realisation of the sort that the architects of the Carnegie Pavilion must have experienced when they were inspired to create their landmark design. 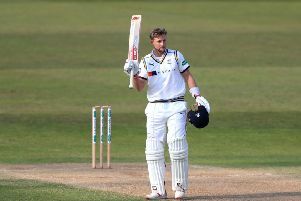 The sound of the car alarm was helping to drown out the sound of the Middlesex fielders, who were chirping away constantly as they tried to gee each other up in pursuit of wickets, literally from the moment that the ball was dead to the bowler beginning his run-up again. There is nothing unusual about this, of course, as all teams do it to some extent, but I was struck by how the game is now increasingly played out to an incessant soundtrack of inanities by sportsmen who have little in common with the often elderly crowd who watch them perform. So when James Franklin, the Middlesex captain, was bowling, we were treated to a relentless diet of “Bowling, Franko”, “Good areas, Frankie boy”, “This time, Franko, lad, this time”, and so on and so on. Or when Toby Roland-Jones was in operation, it was such pearls as, “Bowling, Ro-jo”, “Top work, Ro-jo, fella”, “Got him worried now, Ro-Jo, lad, got him worried”, and so on. I longed to shout down from the stand, “Shut the hell up”, or words to that effect, but by then I was much too busy enjoying the noise of the car alarm. Finally, the alarm stopped, and I did the only thing that anyone would reasonably do in the circumstances – I returned to the press box and drank another vat of wine to help me forget about the whole distressing experience.